This index of articles in Occupational Health includes all of those published beginning in 2011, grouped under topic headings. How the Frost/Black report could shake up occupational health (2013) The Government’s response to the Frost/Black report could see the biggest shake-up of the OH profession in a generation. People watching: the current state of absence management(2012) Research shows how chaotic absence management is damaging employee welfare and productivity. Occupational health poised to tackle staff absence (2012) Overview of recommendations made by the government-commissioned Independent Sickness Absence Review by Dame Carol Black and David Frost, published in 2011. NHS tool to improve quality of occupational health services (2012) The web-based MoHaWK system is designed to provide OH teams with a way to improve quality. The implications of Britain’s ageing NHS workforce (2013) As the working population ages, occupational health advice can help people to stay in work for longer. Occupational health nurses Christine Long and Elizabeth Griffiths look at the effect of ageing on older nurses. Will widespread drug testing at work ever take off? (2013) Drug testing in the workplace is an often contentious issue. This article looks at some of the arguments for and against doing so. Four steps to legally defendable drug testing in the workplace (2012) Areas to consider when implementing a drug-testing procedure. SPREADE provides proactive approach to alcohol awareness (2012) SPREADE is a method of managing alcohol-related issues at work. How to set up an OH service for the armed forces (2011) How to set up an OH service to help support the military. Stepping up audit practice in occupational health (2013) Five years ago, Dame Carol Black’s review of workplace health recommended that the occupational health profession raise its game. As a result of staff training, improved organisation and a better evidence base, it has acknowledged the need for and vastly improved its audit structures, tools and processes. Data analysis improves clinical audit process (2011) Gathering data is only part of the audit process – analysis can provide continued clinical improvements. Body-mapping tools help spot workplace health risks (2011) Body mapping is a tool for identifying the causes of work-related disorders. Focus on breast cancer and the workplace(2011) Research offers insights into how much support organisations should offer those affected by breast cancer. Raising awareness of skin cancer in the construction industry (2011) A campaign that aims to raise the awareness of skin cancer in the construction industry. Getting involved in occupational health nurse-led research (2013) How to start directing and participating in occupational health research. How JISCMail can improve your occupational health practice (2013) Whether you are a student or a professional, the academic online forum JISCMail can provide answers to all kinds of occupational health questions. Diane Romano-Woodward explains how the system works, user etiquette and how to join. Benefits of mentoring programmes in occupational health (2012) Mentoring can help OH practitioners maximise their career potential. How to develop a career path in occupational health (2012) Potential pathways for career progression in OH from an experienced practitioner. Meeting professional standards in nursing and midwifery (2012) A survey of CPD requirements and forthcoming changes including revalidation. Recognised to a degree: the changing face of occupational health(2012) How OH degrees and training are changing to accommodate legislation and industry requirements. Confidentiality and record-keeping in occupational health (2012) Legal guidance on the legislation that covers employee rights when dealing with patient data. Assessing the risk of Creutzfeldt-Jakob disease (2013) The risk of contracting the deadly Creutzfeldt-Jakob disease at work is still unknown, but health protection bodies consider the threat serious enough to require a register to monitor exposure. Occupational health practitioners have a key role to play, says Katie Oakley. Survive the norovirus (2013) Everyone has experienced an illness that rips through the workplace like lightening. Occupational Health magazine offers tips for both employers and staff to minimise the risks. How to deal with the effects of domestic violence in the workplace (2013) While often seen as a “women’s issue”, domestic violence has a huge impact on businesses and their staff. This article looks at what companies can do to help employees who are trapped in a cycle of abuse. Reasonable adjustments and the ticking clock of the law (2013) Employers know that they have a responsibility to make reasonable adjustments for employees with disabilities, but a change to the law has added that these must be made “within a timely manner”. A quick guide to incapacity dismissals (2012) The legal issues employers need to consider when dismissing an employee on the grounds of incapacity. Managing the risks to lone workers (2012) How to evaluate and effective handle potential risks to lone workers. Determining reasonable adjustments for disabled staff (2011) Making reasonable adjustments for disabled employees presents employers with something of a dilemma in deciding what, legally, can be considered reasonable. FOHNEU speaks out for occupational health nursing (2011) The Federation of Occupational Health Nurses withing the EU was set up to provide a voice for OH nurses in Europe. Occupational health teams and GPs discuss impact of fit note (2012) A report on a meeting of OH practitioners and GPs in Wales. Employees with epilepsy: good-practice guidance (2012) Guidance for OH practitioners from Epilepsy Scotland on managing epilepsy in the workplace. Fits, faints and blackouts: the role of occupational health (2012) How OH teams can help manage employes who are at risk of passing out suddenly or have frequent fits. How effective is the Fit for Work Service? (2011) Case study of the Leicestershire Fit for Work Service pilot. Help your staff to help themselves with workplace health checks (2013) Workplace health checks can offer employers just as much benefit as their employees. This article looks at integrating them into an organisation. How to handle hand-arm vibration syndrome (2013) What occupational health practitioners need to know about helping those who work with power tools on a daily basis. Counterweight: a proactive approach to workplace obesity (2012) An evidence-based awareness scheme helps tackle obesity issues at an early stage. How to help staff stop smoking (2012) How to introduce a smoking cessation programme in the workplace. Ten ways to encourage healthy eating at work (2012) How to encourage healthier eating habits in the workplace. Adding value with workplace vision screening (2013) Occupational eyecare can do more than just help companies ensure they comply with health and safety regulations. Specsavers’ Jim Lythgow looks at how it can add value. Eyesight and vision in the workplace (2013) Good vision is often a requirement for many professions. In part one of this two-part series on vision, Professor David Thomson looks at vision screening standards and their place in occupational health. Occupational health’s role in preventing hearing loss (2013) Any occupational health practitioner who is likely to find themselves working in an environment where noise is a risk needs an understanding of how hearing loss can come about. Occupational Health magazine provides an overview. How to identify illness deception in the workplace (2012) How can OH identify the minority of employees on sick leave who are malingerers? Campaign aims to increase NHS staff flu vaccination (2011) How the NHS launched a 2011 campaign to boost uptake of influenza vaccinations among its employees. Immunisation: protecting workers from disease (2011) Policies and procedures for vaccinations given by OH practitioners. Guidance on glove use and the prevention of dermatitis (2012) Guidelines from the Royal College of Nursing on wearing gloves in a healthcare environment, including protection against dermatitis. The rising tide of tuberculosis(2012) Article discussing OH’s role in ensuring cases of tuberculosis remain contained and what to do if an employee in your workplace is diagnosed with the disease. IT’s vital place in occupational health (2013) Whatever your feelings about technology, there is no escaping that it has become a vital part of our working lives. Occupational Health magazine explores how the software available to the occupational health profession can help make the day just that bit easier. Can cloud computing be utilised in occupational health? (2012) Cloud computing provides a means of storing and accessing personal data over a network and can support OH recordkeeping. Effective use of technology in occupational health (2011) Keeping track of technological advances could allow OH professionals to realise several efficiency improvements. Why occupational health nurses should acquire leadership skills (2012) A research paper looks at the evidence base for OH acquiring leadership skills. Contracts and occupational health: what you need to know (2012) An overview of contracts and the contracting process. Maximising your occupational health budget (2012) Practical advice on how to manage OH budgets. Cutting health risks through manual handling training (2012) The importance of manual handling in promoting and improving health at work. Helping young people with autism into work (2013) The National Autism Strategy aims to help all adults with autism into work. Kellie Nauls, project coordinator for the Moving On Employment Project in the Shetland Islands, talks about how a pilot in the region is helping young people with autism to find and keep a job. How practising mindfulness in the workplace can boost productivity (2013) Mindfulness offers a host of benefits to employers and employees alike, reports mindfulness expert and coach Liz Hall. Improving the work-life balance through stress reduction (2013) With more people than ever before experiencing workplace stress, psychotherapist Jamie Patterson looks at various tactics for reducing anxiety levels and improving the work-life balance. Stress in the world of academia (2013) Modern-day academia has recently been proven to be one of the most stressful professions in Britain. What can employers do to help mitigate this for their staff? A simplified approach to workplace stress management (2012) How engaging staff at all levels of the workforce to make them feel more valued can reduce stress levels. Benefits of mental health first-aid training (2012) A specialised form of first-aid training can improve support in the workplace for any employees that might be suffering from mental ill health. Changing attitudes to mental health (2012) Guidance and research shows how OH can reduce the stigma of mental ill health. Empowering trauma victims (2012) Steps employers can take to assist staff in dealing with a traumatic event. Guidance on managing stress in the workplace (2012) A set of standards developed by the Health and Safety Executive, the British Standards Institute, as well as universities and employers, is designed to help manage stress in the workplace. How to help employees cope with post-traumatic stress (2012) Employers can take steps to minimise the post-traumatic stress caused by distressing incidents at work. How to treat panic attacks in the workplace: a case study (2012) A case study showing how to manage employees who suffer from panic attacks. Mindful Employer: making a difference in mental health (2012) A look into how the Mindful Employer initiative helps support employers to deal with staff that have mental health problems. Mindfulness: helping employees to deal with stress (2012) Mindfulness techniques can help staff cope with workplace pressure. Non-clinical approaches to mental health (2012) Research from one of Dame Carol Black’s fit-for-work pilots demonstrating the value of non-clinical interventions for supporting return to work for employees with mental health problems. Tribunal decision advises training in mental health (2012) Case law advising employers to provide training for line managers in managing stress and mental health problems. How to support line managers in dealing with mental health (2011) OH can support line managers by improving their knowledge of mental health problems. Mind calls for increase in mental health support (2011) A campaign from mental health charity Mind aims to improve workplace support for employees suffering from mental ill health. OH support for mental health problems (2011) OH professionals can support traumatised employees and colleagues affected by them. Tackling organisational stress at work (2011) Methods of tackling stress that focus on teams as well as individuals can help to reduce conflict and control it. Website offers guidance on mental health issues (2011) A website developed by the Royal College of Psychiatrists offers guidance for those involved with issues relating to work and mental health. Easing chronic back pain with the Alexander technique (2013) A set of exercises can offer non-prescription relief for those with back pain. Alexander technique teacher Mille Ball finds out more. Case study: back pain and assessing fitness for work (2012) Case study on assessing fitness for work in employees with a back injury. How to condition your body for work (2012) Exercises that can help with problems caused by sitting in a chair for long periods. The impact of carpal tunnel syndrome (2012) A discussion of the best way to handle one of the most common musculoskeletal disorders when it presents in the workplace. Sharps practice in occupational health – what you need to know (2013) Occupational health nurse adviser Diane Romano-Woodward gives an overview of the legislation and best practice surrounding the use of sharps in occupational health practice. Helping to minimise the risks of sharps injuries (2012) The Royal College of Nursing and other bodies respond to EU Directives on sharps injuries and infection. Helping healthcare employers to prepare for sharps Directive (2011) EU legislation calls for employers to take steps to reduce sharps injuries in the healthcare sector. Customer care’s importance in occupational health (2013) Customer care and client relationships can make or break the reputation of OH providers. Director of Working Well Solutions Jane Coombs shares some tactics to promote a harmonious working relationship. 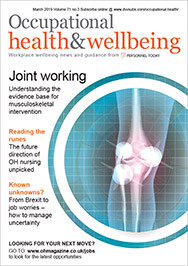 How the NHS reforms will affect occupational health (2013) With the NHS reforms poised to jump into full swing, Occupational Health magazine looks at how occupational health practitioners will be affected by the organisational changes. Improving occupational health services in the NHS (2011) OH practitioners’ involvement in the process of changing the framework for NHS OH provision. NHS occupational health services: setting the standard (2012) Findings from an NHS survey of OH pensions have lessons for other OH service providers. How occupational health can help to manage presenteeism (2012) Suggestions for what OH can do to manage the growing problem of employee “presenteeism”. Healthcare consultants: adding value to occupational health (2012) Private healthcare companies are developing consultancy services to ensure cost-effective solutions to health issues in the workplace. The need for a joined-up approach to health insurance (2012) Why private medical insurance should be viewed as a vital part of occupational health spend by employers. Professional qualities of occupational health nursing (2011) Maintaining professional standards is key to the state of OH nursing and its impact across industry. Public health: encouraging employers to take responsibility (2012) Dame Carol Black speaks to Occupational Health about the Public Health Responsibility Deal, an initiative to improve the wellbeing of UK workers. White Paper suggests OH practitioners can impact public health (2011) The government White Paper “Healthy Lives, Healthy People” published in December 2010 offered OH practitioners an opportunity to influence the public-health agenda. Taking a history and making a functional assessment (2013) During a clinical assessment, a patient’s history can be the key to helping an OH professional decide if someone is fit for work or not. This article explains how best to conduct the process. Guidance on occupational health case report writing (2012) Case management reports should ensure OH referrals are dealt with in a timely and efficient manner. Return to work through vocational rehabilitation (2011) A vocational rehabilitation model using occupational therapists challenges OH approaches. SEQOHS sets the standard in occupational health (2011) The aim of the Safe Effective Quality Occupational Health Service (SEQOHS) accreditation scheme is to become the recognised standard for OH service provision in the UK. The risks of falling asleep on the job (2012) Sleep deprivation can result in impaired judgment, lower productivity and a higher likelihood of accidents. This articles looks at the steps employers can take to ensure their employees are getting sufficient sleep. Understanding the effects of sleep disorders on employees (2011) OH specialists can address irregular sleeping patterns. How to manage sleep disorders effectively (2011) How an employer can manage the effects of insomnia on employees. Why should SMEs invest in occupational health? (2011) Why small and medium-sized enterprises should invest in OH, and how OH service providers can decide on the type of services to offer. Society of Occupational Medicine offers affiliate membership (2011) From 2012, the Society of Occupational Medicine has offered affiliate membership to associated healthcare practitioners, including OH nurses. Safety and financial issues to consider when travelling for business (2012) The safety measures and financial issues employers must consider for staff travelling for business. Acas: Linking employee wellbeing and engagement (2013) Employee wellbeing and workforce engagement are intrinsically linked, and Acas is doing its part in helping employers meet these new challenges. Getting staff to work together with HealthyTeams (2013) A look at the HealthyTeams approach to wellbeing services for staff, including two case studies. Helping staff maintain a healthy outlook (2013) Occupational Health magazine finds out how UKFast, an award-winning internet hosting company, benefits by helping its workers to stay healthy, both physically and mentally. Online service provides free access to wellbeing resources (2013) A free, web-based initiative that aims to make it easier to engage employees in wellbeing schemes. Yoga can help improve employee wellbeing In an article about the use of alternative therapies in the workplace, Victoria Morrison looks at the health benefits of yoga for the working population. Medtronic: Focusing on health (2012) Case study examining how one company built a unified health and wellbeing programme for its global network of employees. How to define an employee wellbeing strategy (2011) The first article in our employee wellbeing 10-part series defines “employee wellbeing” and gives practical advice on how to develop initiatives. Making the most of employee wellbeing initiatives (2011) Article two in the employee wellbeing 10-part series looks at how employee wellbeing is an important factor in organisational performance. Who should manage employee wellbeing? (2011) Article three in the employee wellbeing 10-part series considers who should take responsibility for the development of employee wellbeing within an organisation. Using evidence-based management in employee wellbeing (2012) Article four in the employee wellbeing 10-part series looks at how evidence-based management can support the development of an effective employee wellbeing strategy. Determining the costs of employee wellbeing (2012) Article five in the employee wellbeing 10-part series shows how to determine the costs of employee wellbeing programmes. Ten steps to implementing an effective wellbeing programme (2012) Article six in the employee wellbeing 10-part series offers 10 steps employers should follow for an effective employee wellbeing programme. Employee engagement versus employee wellbeing (2012) Article seven in the employee wellbeing 10-part series looks argues employers should shift their focus from employee engagement to wellbeing to improve performance. Tackling presenteeism through employee wellbeing(2012) Article eight in the employee wellbeing 10-part series looks at how wellbeing programmes help tackle presenteeism. Tackling presenteeism through employee wellbeing (2012) Article nine in the employee wellbeing 10-part series looks at the five key pitfalls employers should avoid when introducing employee wellbeing initiatives. How occupational health provision can affect employee wellbeing (2012) Article 10 in the employee wellbeing 10-part series looks at how OH teams can help add value to wellbeing initiatives. DrummondHR tool aims to improve employee wellbeing(2012) Research on a wellbeing tool that helps support the return to work of employees after a sickness absence. Using data to direct employee wellbeing initiatives (2012) How employers can measure the return on investment from their spending on health and wellbeing. Understanding the importance of resilience (2012) An OH practitioner highlights the importance of cultivating resilience in employees both in and out of the workplace. Improving productivity through employee health (2012) The impact that overall employee health can have on staff productivity levels in the workplace. Enhancing employee resilience through e-learning (2011) E-learning resource “The Resilient Mindset: Face the Future with Confidence” helps increase worker resilience and the capacity to cope with difficult situations both in and out of the workplaces. Humanisation concept to boost employee wellbeing (2011) A consultancy package from Bournemouth University aims to focus on the human aspects of employees to make them feel more valued. Organisational culture influences employee wellbeing (2011) Workplace culture and job satisfaction have a large impact on wellbeing and absence in any organisation, and OH practitioners should address this. Workplace chaplaincy: providing extra support for staff (2011) Workplace chaplains can help support employee wellbeing.